I've been mascara addict lately... buying this and that. However, there is one mascara that I am truly loving since I got it a month ago. It's Lóreal's Clean Definition Telescopic Mascara. This mascara for me is truly an HG material. For someone who's been blessed with long lashes (thanks to God and good genes) this mascara provides me enough coating, longer lashes without the clumps. Indeed, Vianne was right when she said that Telescopic was a great mascara. Even my aunt from the U.S. who rarely uses make-up is in love with this product. 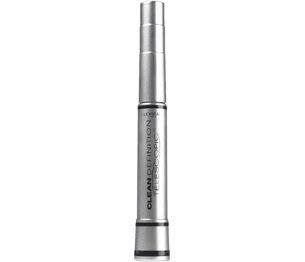 More so, it's thin wand gives me the ability to coat my lashes efficiently without worries of ruining my eye makeup (which often enough I do with other mascaras). It blends well with false eyelashes as well as making it look more natural. L'oreal Clean Definition Telescopic Mascara is a great for everyday use. It's clean precise application will just give me that coating I need to make my eyes pop. Truly flatters my look to nines. The No Clump Brush TM is remarkable. A makeup-freshie's dream if I may add. 8. Thin wand is amazing! 11. Available in drugstores like watsons and department stores, beauty section. 3. Count one to 1-10 when coating each eye to give them an equal amount of coating. 4. Wait a few seconds before second coating. 5. Use the tip (dab it first on a tissue to take out excess ink) to coat the inner part lashes.